Crazy Cars is one of Wario's introduction microgames in WarioWare, Inc.: Mega Microgame$! and reappears as one of the Mash League introduction microgames in WarioWare Gold. 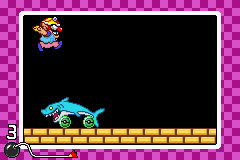 Wario is standing on the left edge of the screen, and a car comes from the right: a potato car, a hot dog car, a shark car, a lightbulb car, a door car, and a teapot car (the final three being exclusive to WarioWare Gold). The player has to press the button at the right time, causing Wario to jump over the car. The car will stop shortly before hitting the player. In this situation, "normal" jump timing will cause Wario to land on top of the car (this would lead to the player failing the microgame), so the player will have to jump after the car keeps moving again. The car will jump shortly before hitting Wario. In this case, jumping at all will cause Wario to collide with the vehicle. This is similar to the car stopping, but the player must react more quickly to not jump. The car will stop, then drive in the other direction. The car comes out miniature-sized, and merely bounces off of Wario if it touches him. The door car will stop, open, and release another car. The car will stop and not move at all after doing so. This microgame originally appeared in Mario Artist: Polygon Studio in the Sound Bomber mode under the name "JUMP". 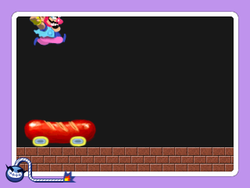 In this version, the player controls a generic figure instead of Wario and the "car" is whatever model the player is currently working on. Aside from lacking the two scenarios in which the player doesn't need to do anything, the microgame behaves more or less the same. This microgame appears in Super Smash Bros. Brawl, Super Smash Bros. for Nintendo 3DS, and Super Smash Bros. Ultimate, as part of the WarioWare, Inc. stage. Like in the actual microgame, fighters must avoid the car that's about to go by. A warning sign will appear so that the players know which side of the screen the vehicle will come out from. This game appeared in WarioWare: D.I.Y. as a game that can be edited, this time retitled Crazy Car. Wario has to jump over the incoming item by tapping the DS screen. Unedited, the incoming item is a car shaped like a shark. This page was last edited on November 26, 2018, at 00:30.